It's been another incredible year updating this blog - it has slowed down the last few months, mainly due to university work and family taking priority, but I'd like to assure you that there's a lot of work and fun still to come. 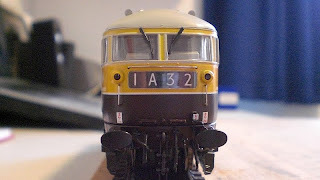 I've had a small haul of modest presents this year, which I think have been much more fun than my usual clamour for model trains, or rolling stock and so on. I've done a few nice things with the family and girlfriend, seen a few films (wasn't Avatar awesome?) and generally got on with writing my dissertation and general final year university work. Christmas has been one of the calmest and most pleasant for years. But its been tinged with some sadness. My research partner at Warwick died suddenly a month ago, and its been tough, I will admit (but by no means as tough on me as it has been on his father). We always toast the "absent friends and family" at Christmas, and normally I only ever thought of immediate family. That was incredibly narrow minded of me. Fact is, everyone around you impacts on your life, and whatever the circumstances of a meeting, you should be grateful for each and every friend and family member, and enjoy their company while it lasts (for nothing lasts forever). 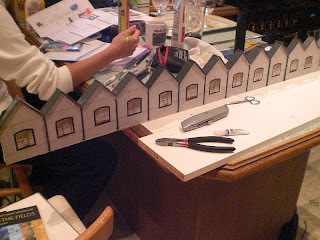 I'd like to end 2009 with this post, because in some ways its been a mixed bag, but there is nothing I regret so much as not trying hard enough - did I try hard enough? Well...I think so. But in the event that I did not try hard enough, I'll put that in the "new years resolutions" box. I found this amongst a few other tatty photographs in a drawer at my grandmother's house. It shows some photographs of Leeds, Copley Hill as my grandfather knew it in the late 1940s and possibly early 1950s. 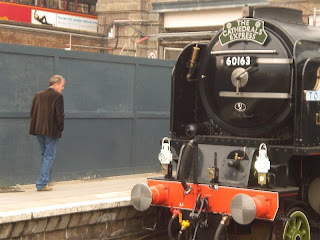 Is that him standing on 60119's front, cleaning its smokebox door? Next time I hope to have 82026 on the layout as well as adding some yard lamps and more weathering to the buildings and rolling stock. It is all Hallows Eve, and Stephen is telling some ghost stories to the other engines. 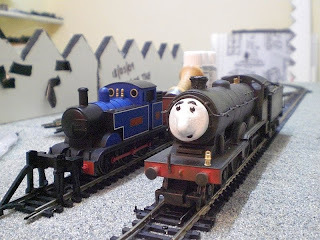 A spectre haunts the yard...what does the mysterious engine want with Stephen? 2007-2010 Music composed by Kevin Macloed. "Heljan's Latest Bird takes Flight"
I took delivery this afternoon of Heljan's latest limited edition model, Kestrel. 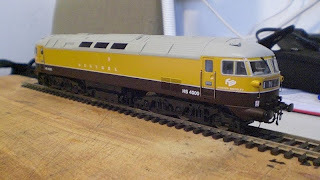 A big shout out to Trains4U of Peterborough who took my order on two years ago when the model was announced. 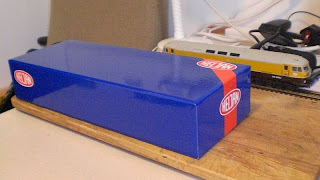 The model is contained in the standard Heljan container - stylish, and protects models perfectly. 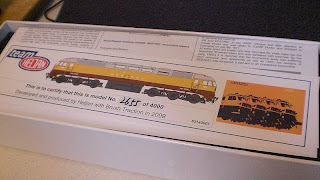 Each model comes complete with a certificate (numbered, with an information pack regarding the prototype chosen and its technical specifications in both model and real form), a spare bufferbeam, a plethora of spare bufferbeam pipes and couplings, and a set of tension lock couplings too. Now for the model itself. Its livery is perfectly applied. All lettering is crisp and legible. In particular the cabside Hawker Siddeley logo is stunning. 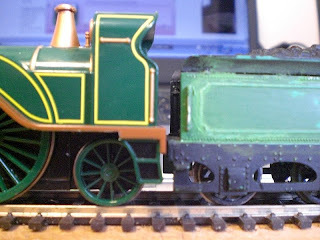 The colours seem to be spot on for prototype photographs, and the general shape and proportions of the locomotive look correct. 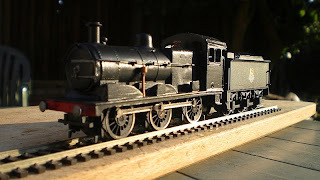 The motor and chassis is based around the Heljan class 47, which has ensured a smooth running and very powerful model locomotive. There is only one minor downside for myself. This was not noticeable until it was pointed out on another forum. 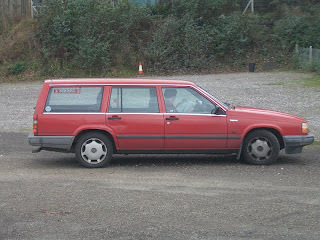 The moulded horns on the cab roof are disappointing in shape. 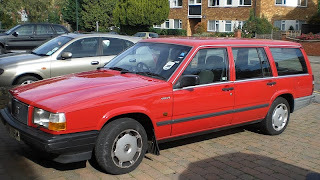 However I should point out that I have seen worse representations on other (and current) models. There are no other real problems at all. Roof detail is all moulded, but captures the look of the prototype perfectly. 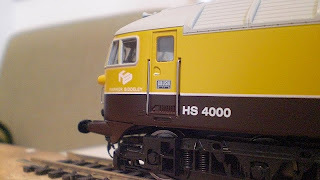 In short, I feel Heljan have produced a worthy succesor to their Falcon model of two years ago and produced a stunning model of a unique locomotive. 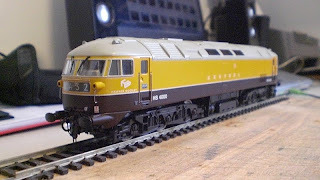 This is one pleased customer who will be making a rather unique lineup of Kestrel, Deltic and Falcon at Christmas in a short video parodying Top Gear somewhat! Roll on Lion, please Heljan! Time for an update on the GNR no.1! 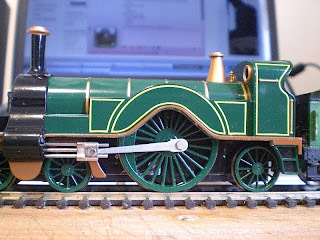 To begin with, we have the Bachmann Emily Model, minus face, and with a Kitmaster stirling single tender attached. 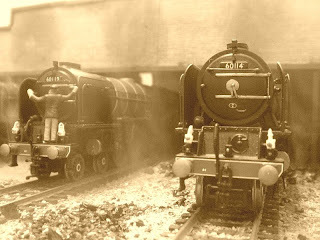 The tender came as part of a strange lot of engine plus trucks (and the Triang 3F which was paired with the tender became my J17). 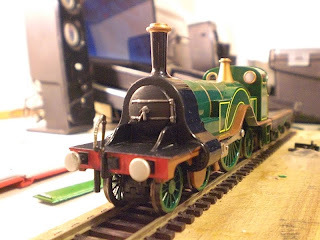 The Bachmann Emily needed some carving, and I am most grateful to the LNER Encyclopedia forum for some tips as to where and how to carve the body up. 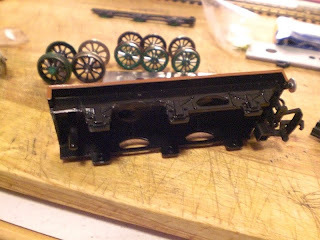 The engine's body has had a few changes made. 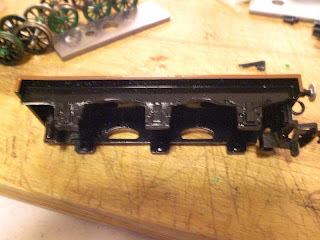 I had drilled out the cab spectacles, cut down the running plate on both sides, removed the moulded handrails and added a suitable smokebox door. 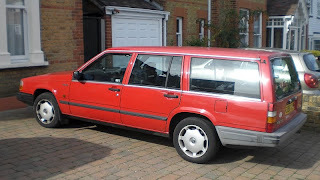 The tender at this point was still in its form from when it had been built by its previous owner. 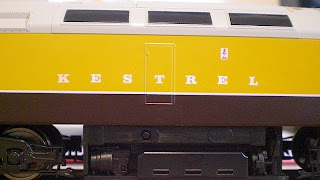 There was an obvious problem with the heights between the cab and tender (see above). 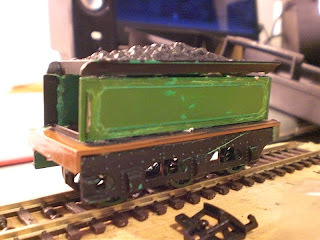 I decided to carve up the Kitmaster tender and mix 'n' match the components from the Emily tender to make one tender which was distinctly more GNR like. 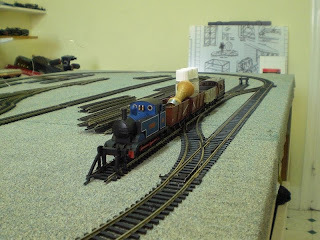 This also meant I'd have a better ride height, and it also meant that I could attach the tender in the original (more efficient) arrangement. The competition will run until December 20th 2009. 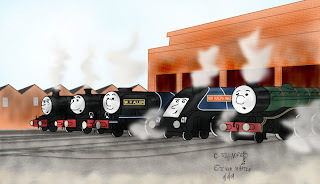 The rules are simple: you must create your own engine character to appear in a BRWS Short episode. Your character must appear in a youtube video introducing him or her self – for example, talking about their place of work, their hobbies (i.e listening to cricket on their driver's radio), favourite colour, whatever! "BRWS Character Competition - Name of Entrant & Name of Entry". The video can be in any film form - modeled, animated, and so on. All videos must be posted as a “Video Response” to the Competition opening video. There is no time limit to the video length. There is a special “Mystery Guest Judge” for the competition. All decisions take by our mystery judge will be confidential and and all decisions will be final. Now for the prizes! 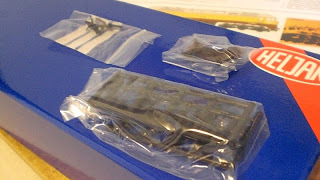 They are all items of 00 scale model railway equipment. 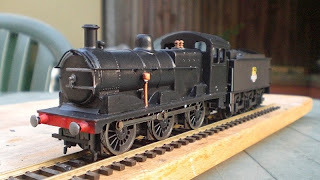 Firstly, there will be a special prize for “most original thinking” - the winner will win a model steam engine from the Hornby Railroad Range. 10th, 9th, 8th, and 7th places will win a truck from the Hornby Railroad Range. 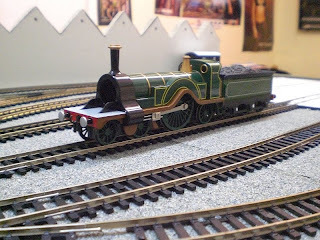 6th, 5th and 4th placed prizes will be a model steam engine from the Hornby Railroad Range. 3rd , 2nd and 1st prizes are very special indeed. for a BRWS short (with names of creators in beginning and end credits). question (and a special treat included on the disc too)! The overall 1st place winner will also receive this specially made model of the character "Gronk". If you are placed within the competition and are due to receive a prize, you will be required to email a name and postal address in order to receieve your prize. Prizes will not in any way be reallocated. So – get your camcorders out! Put your thinking caps on! Get out those history books – and come up with the best original character you can think of. 1. The competition supervisor reserves the right to disqualify any entries that break copyright law, abuse individuals or groups, take part in "trolling" or otherwise bring the competition into disrepute. 2. There is only ONE entry allowed per Youtube Account. 3. All entries MUST be posted by 20th December, and as a Video Response to the Competition Video. There will be no exceptions. 4. Winners MUST send a legitimate mailing address in order to receive their prizes. No personal contact details will be revealed or otherwise made public at any time. And here it is! I've been working from a few books, some photographs I bought copies of, and the ever useful Flikr for this particular bit of scenery. 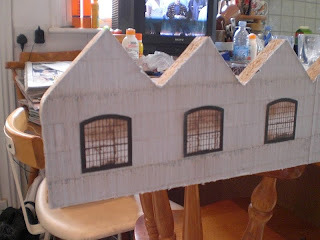 It is much more accurate than the red brick backscene I made for the Day of the Deltic episode! 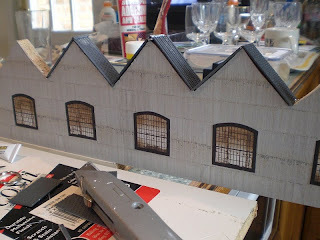 Things still to finish: the shed to do, lights to fit. Until next time! 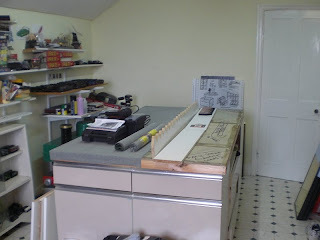 A few photographs of some work at 56C then. 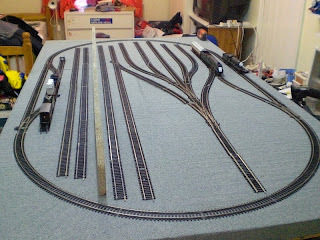 Seen above, the "concrete" (in reality Polyfilla) has been put down to form the base for the new five road shed layout. I've had fun putting 60006 onto each road this afternoon, checking the formation and praying it works each time...which it has, thankfully! 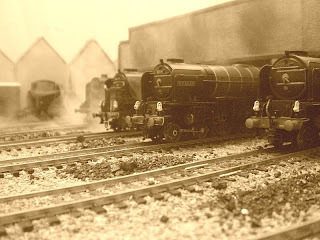 You can find more information on this through clicking the "Copley Hill Layout" link in the "Eastern Region Connections Box" at the left hand side of the main page. Other than that, a good start I think!!! It's my birthday today! Had to write an update. My birthday was the ninth of september in nineteen eighty seven - actually being born at nine minutes past nine on that day. Freaky! Twenty two years later, the date is 09/09/09 (which happens once in a hundred years) and at nine minutes past nine, it is my birthday again. Hooray! 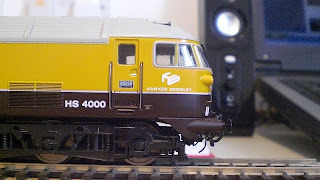 Got some lovely presents for the layout from friend Mark and girlfriend Charlotte (thanks guys - means a lot to me). 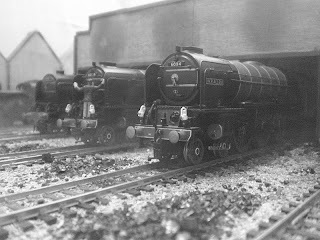 One Royal Scot and a K3 - perfect pressies. The K3 is going to have a little unorthodox modification to it. A set of nameplates ("Charlotte"). ...but thats' another story! Until next time, thanks for everything, everyone. And after about an hour of moving things about, the track plan I had come up with a few months back finally appeared in track form! To the left is the "lot". 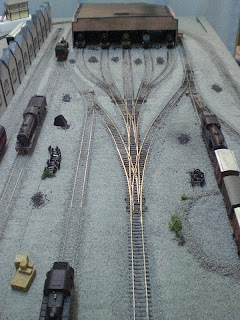 It basically compromises a small siding for works trains and a storage line for trucks/etc which will reside there when not in use. 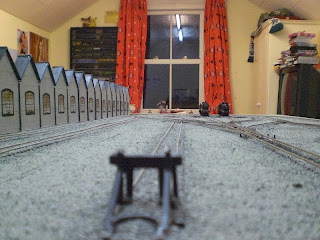 The white strip of wood is the new backscene for the carriage works, and to the right of that is the five road engine shed and sidings, with the main line forming a complete loop of the board. 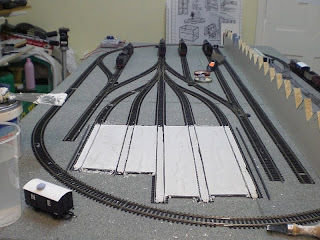 There are two three way points to be installed, none of the track in the shed area has been pinned done as wiring needs to be completed! I leave you then, with this photograph of main character "Stephen" meeting "Stuart". 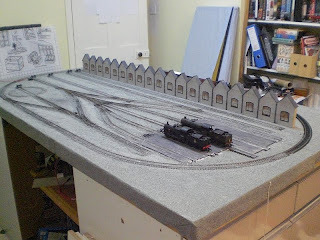 As I type this, I am constantly looking over my shoulder towards the bare baseboard that will, hopefully, by the end of the day, be covered in an arrangement of scenic mats, gravel chippinps, coal dust, and of course, model locomotives. 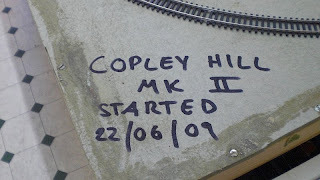 It's been around a month since I took apart Copley Hill Mk1, and not much has gone on in that time frame. 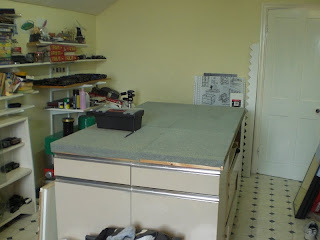 Most of it has been ordering bits and bobs from websites, again, mostly scenic scatters and brick shaped plasticard. The set itself is a lot bigger in size than it has been previously. 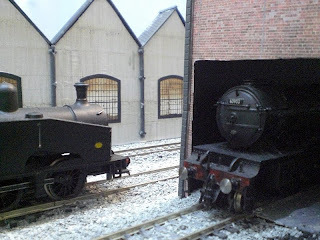 I am not going down the route of the small shed this time - the next one shall be a full five road engine shed, with some very ambitious plans for a "proper" floor under the roof of the shed. ...except I have been checking photographs of the real Copley Hill for the last month, and I cannot for the life of me, work out if 56C had a concrete floor - that is to say, rails flush to concrete, not unlike tramrails in that sense, but incoporating inspection pits and the similar. 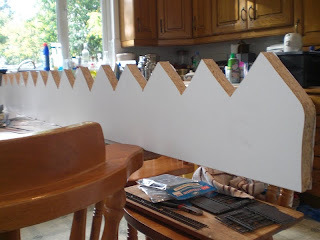 My heart tells me that it should be - and I vaguely recall a photograph of the inside of the shed showing it - but I'm damned if I can find that very important piece of the puzzle now! 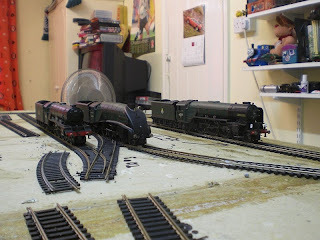 Of course, its never been entirely accurate throughout The British Railway Series - it gets better with every episode batch. 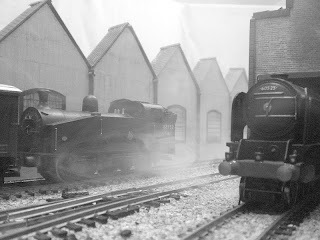 I strive for more accuracy, better looking sets and generally a much more atmospheric look to the series. 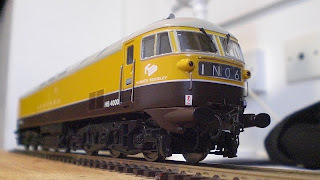 So for the moment, I'll leave you with the above photograph of my new A4 pacific - in British Railways brunswick green, it is named and numbered 60006 Sir Ralph Wedgwood. A poignant reminder, that no matter how much we try to change things, some things are constants and should be treated thus. 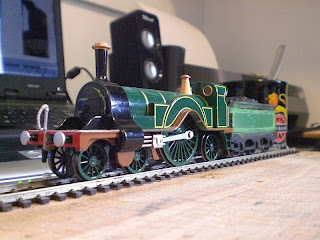 One last push to finish for the PW Forum's Staff Comp, which ends 21st July, and I'll be a happy modeller! I'll leave you with one last pic - until next time! 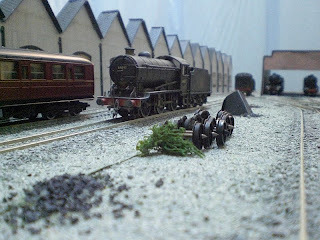 Yesterday evening I finished dismantling the snow set of "Copley Hill". It had to go - I have now made a promise to myself - "Day of the Deltic" is going to be the last snow episode I ever do, ever! 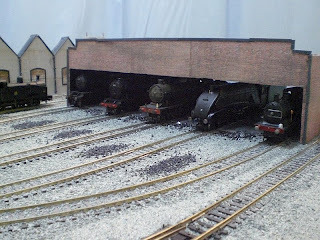 A new and better designed set, which will be more in keeping with the real thing, is being constructed over the next few weeks and will appear in my "making of" video on youtube. I'll leave you with this delightful tidbit - the inaugural run on the new layout, a stock move of number 60163 and her support coach. Well, what can be said except "wow"! 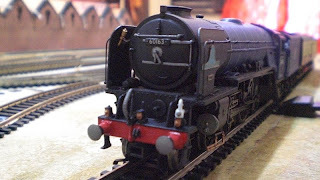 As some of you will know, I'm a covenator for the A1 Locomotive Trust - and I absolutely love their creation, Tornado. 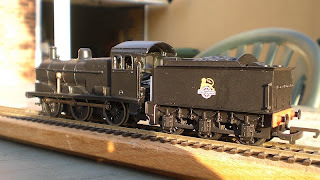 My late grandfather was a fervant supporter of the trust, but sadly died in 2001 long before the boiler was ordered, and she became a whole engine. 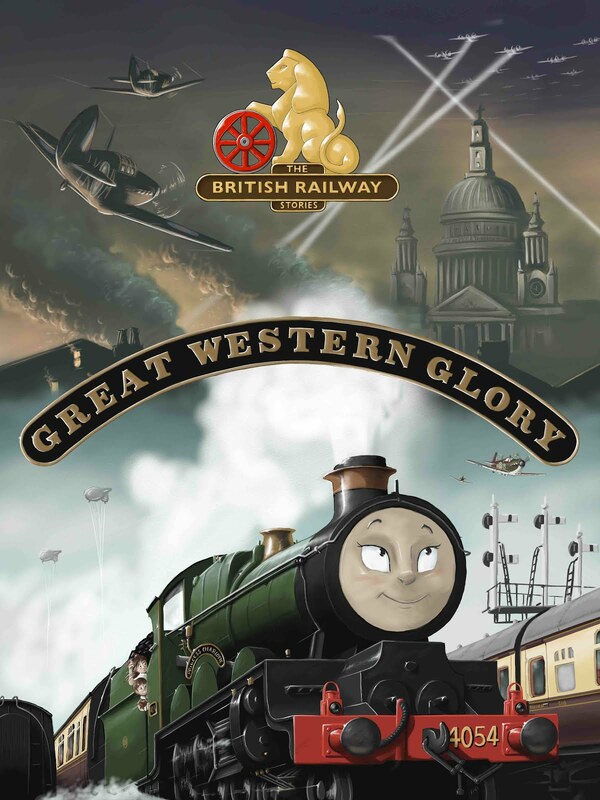 With the royal naming, the LNER gala at Barrow Hill, and now this - a wonderful hour of entertainment in a race to the north on BBC's Top Gear, this is all part and parcel of showing the world that Tornado means business.